The Ancient Near East and archaeology have been a source of great inspiration for the cinema. Fact and fiction meet for the better and the worst. The BAF takes it from there. The aim of BAF 35 mm is to inform popular representations of the Ancient Near East and archaeology by bringing science into the frame... BAF 35 mm therefore strives to organise cinematographic events, such as film series (see below) as often as possible. In 2018, we are delighted to present a cinematographic adaptation of the Sumerian text known as Edubba A. This may possibly be the first film in Sumerian ever to be made... It was produced in the context of the Sumerian course of the University of Bern (Switzerland), starring students of assyriology and archaeology from the universities of Bern and Geneva. Edubba A tells of the turbulent day-to-day life of a student in southern Mesopotamia somewhere between the late third and early second millennia B.C.E. The film premiered in Geneva on 27 April 2018. 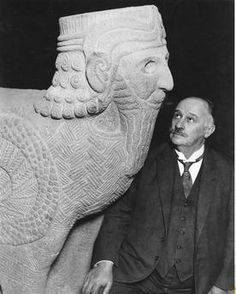 This documentary by Maurice Philip Remy (Germany 2003) tells the story of the archaeologist and diplomat Max Freiherr von Oppenheim, a marking figure of the twentieth century. Introduction by Prof. Dr Mirko Novák (Bern University). In German. Following up on Charlotte Trümpler's keynote lecture we will be screening rare footage taken by Agatha Christie on Max Mallowan's digs in Tell Brak, Chagar Bazar and Nimrud (1938/1952-1957). Free entrance. Registration at Kino Rex required.